Open Minds has been working together with Endeavour Foundation to improve the life of client, Matt, by enabling him to travel in the car more and lead a more positive future. Matt is a 33-year-old from Burpengary; for him, having autism means that he requires full 24-hour support and stable living arrangements. The Open Minds team provide support that includes: cooking, cleaning, health care, community access, and anything else required to ensure Matt leads a positive and happy life. Because Matt is non-verbal, communication can be tricky. The Open Minds team have therefore worked to communicate and create understanding, whilst building rapport and gaining his trust. Over the 17 years they have worked together, Matt has formed a close bond with his Support Worker, Ed from Endeavour Foundation. Ed was the only Support Worker who Matt trusted to travel in the car with, which was problematic if other Support Workers needed to take Matt to important GP appointments when Ed wasn’t around. Matt’s father, Brian, who visits every week, was also concerned about the impact this would have on Matt’s health and future. It was therefore vital for the Open Minds team to work collaboratively with Brian, Matt, Ed and the Endeavour team to build trust and get Matt feeling comfortable in the car with his other Support Workers. The team started out with Ed in the car and parked up at the local library, allowing Matt to adjust at his own pace to Ed stepping out of the car. 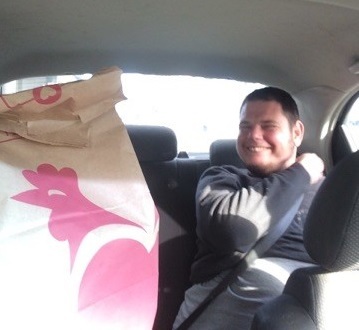 The team were then able to swing by Matt’s favourite drive-through restaurant, Red Rooster, to ensure that his first car journey without Ed was a positive and enjoyable experience. The collaborative effort resulted in success, Matt experienced a car journey without Ed for the first time in many years. The team are continuing to work with Matt to reach milestones to work towards his recovery journey. Find out more about the Complex Care support that Open Minds provides, or get in touch today. With aging carers, it was crucial for Wayne to find somewhere to live, have assistance with daily living tasks, complex support, and positive behaviour support. Wayne and his family were relieved that Open Minds were able to provide the support he needed for a positive future. Don, aged 67, acquired a brain injury 15 years ago, rendering him unable to speak. With the support of Open Minds, Don has made great progress on his recovery journey and is now able to speak again.